Jules Gauthier opened Candi Werx on Concession Street in December. More new faces are popping up along the Mountain’s oldest shopping district. 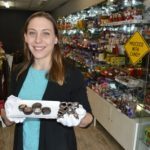 “I think it has a lot of untapped potential,” said Jules Gauthier, owner of Candi Werx, a candy, chocolate and novelty store that opened on Concession Street Dec. 1. Gauthier moved to the Mountain after many years in the hospitality industry including nearly 10 years running her chocolate business at the downtown farmers’ market. She said a lot of her clients have followed her to Concession Street. Mike Lan said the large amount of pedestrian traffic in the area convinced him to open Concession Pizza back in September. “We took a look and we saw the hospital and church and said we’ll give it a try,” said Lan, who had been considering opening a restaurant in the downtown area. While she’s not new to the street, Serena Paproski expanded her Studio 440 salon and spa business on Dec. 1 by moving from a house on Concession west of Upper Wentworth to a storefront location just east of that street. “It’s a bigger location,” said Paproski who has gone from less than 500 square feet and four chairs to nearly 1,000 square feet and six chairs. Paproski said the availability of more nearby parking was a key decision in the move. Another new business, Halal Fried Chicken, recently opened. Leo Santos, chair of the Concession Street Business Improvement Area, said the new businesses will bring more customers to the area, adding they area a clear vote of confidence for the street. “I think what we’re seeing is the interest in the area, in the community for business development and for entrepreneurs to start something,” he said.